The Beast's housekeeper and Chip's mother. She became a teapot when an enchantress put a spell on the castle. Mrs. Potts is always ready to warm your heart with a comforting cup of tea. "If I could, I'd like nothing more than to serve you some tea." Mrs. Potts is a character from Disney's 1991 film Beauty and the Beast. She was introduced to the Kingdom Hearts series in Kingdom Hearts II, playing a minor role in Beast's Castle. Angela Lansbury, Mrs. Potts's original voice from the film, reprised her role for the English version of the game. Although she does not physically appear, her image can be seen in Sora's Dive to the Heart. Although Mrs. Potts does not directly appear in the game, she is briefly mentioned by Cogsworth during Mission 83, as she describes the cloaked stranger in the castle. Prior to Sora's arrival at Beast's Castle, Beast was being taunted by Organization XIII member Xaldin. In his rage, Beast locked up Mrs. Potts and the other servants in the castle dungeon. When Sora, Donald, and Goofy arrived at Beast's Castle, they were sent to rescue the servants at Belle's request. Upon entering the dungeon, Sora and company were surprised to find that the cell, which supposedly held the imprisoned servants, only contained household objects. Cogsworth, the castle's butler, was reluctant to reveal himself to Sora, but Mrs. Potts immediately suggested that it was safe, noting that Sora and his friends did not look like "them" (it can be assumed she was referring to the Heartless). After introducing themselves to Sora, the servants explained their situation: the Beast was once a prince who had been cursed by an enchantress to appear as a monster for his selfish and uncaring personality, and the castle's inhabitants had been cursed to appear as household objects. Once freed from the dungeon, Mrs. Potts, her son Chip, Cogsworth, and Lumière guided Sora and co. through a secret passage out of the dungeons to avoid any attacks by the Heartless. However, lanterns throughout the passage were seeping with darkness. Mrs. Potts gets the group past this obstacle as she followed Sora to each lantern and doused the darkness with water from her spout. After exiting the passage, Mrs. Potts, Chip, and Lumière departed from the group to attend to their duties in the castle, staying in the parlor to avoid confrontation with the Heartless. They remained out of the main action until after Sora, Donald, Goofy and the Beast rescued Belle from the Shadow Stalker/Dark Thorn that Xaldin had set after her. Following this event, along with a small amount of bickering between Belle and the Beast, Mrs. Potts attempted to remain optimistic that the two would manage to develop a stronger relationship. When Sora returned to Beast's castle later on in his journey, the servants had organized a special evening for Belle and the Beast in an attempt to bring them closer together. When Xaldin showed up to crash the party, Belle, Mrs. Potts, and the other servants retreated to the safety of the ballroom's balcony. After Sora and the Beast defeated Xaldin's Nobodies, the Beast ran to his room to ensure that Xaldin had not stolen his rose. Mrs. Potts seemed especially concerned about the rose, though she would not say why. When it was discovered that the rose had indeed been taken, and that the Beast had banished Belle from the castle in his despair, Sora finally decided to find out why the rose was so important. Mrs. Potts helped explain that the rose represented the countdown to when the Beast would have to find true love or remain as a beast for all time. She and the other servants begged Sora to help the Beast, which he did, eventually defeating Xaldin and taking back everything that was precious to the Beast. In the end, Mrs. Potts watched Belle and the Beast make amends, and remarks that Belle was unique in that she is "always ready for a little adventure". In Deep Jungle, cups resembling Mrs. Potts and Chip are present near the tent. The curse transformed Mrs. Potts into a large, white teapot. She has blue-green eyes and thin, black eyebrows. Her base is purple with gold lining and a pale, alternating pink and blue pattern on it. The lid on her head is purple with wavy edges and gold lining. The handle is a pink ball on the top of the lid. Although never shown in human form in Kingdom Hearts, the Beauty and the Beast film reveals that she is a short, squat older woman with a pink servant's outfit. Although her role is minor, Mrs. Potts is shown to be very motherly, looking after the castle's residents. Unlike the cautious Cogsworth, Mrs. Potts is quite forthcoming in trusting people, immediately welcoming Sora despite him being a total stranger. Regardless of how stressed the Beast and Belle's relationship gets, Mrs. Potts is always optimistic, believing that the two will fall in love. 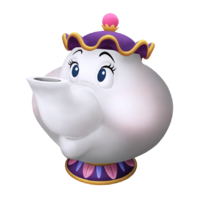 Mrs. Potts cannot completely destroy darkness, but she can assist in doing so by showering it with water from her spout. However, to completely get rid of any darkness, she requires the aid of the Keyblade and Lumière's candlelight. Mrs. Potts made her first appearance in Walt Disney's 1991 film, Beauty and the Beast. She, like the other castle's residents, were turned into household objects by an enchantress as punishment for Prince Adam's cold heart. Many years later, Belle's father, Maurice, stumbles upon the castle to escape wild wolves and Mrs. Potts and the other servants warmly welcome him. However, the prince (now known as the Beast) discovers his and locks Maurice in the dungeon as Mrs. Potts and the servants sadly watch. When Belle arrives at the castle in search for her father, Mrs. Potts, Chip, witness this and quickly goes to inform her. Mrs. Potts, however, does not believe until another servant, Fifi, announced it. After Belle agrees to stay at the castle so her father could go free, Mrs. Potts and Chip serve tea to her in her bedroom, comforting an upset Belle. On the night that Beast invited Belle to dine with him, Lumière and Mrs. Potts attempt to teach Beast how to act like a gentleman, a task that was quite difficult. Throughout the film, Mrs. Potts and the other servants observe Beast and Belle's budding romance, giving them hope that the curse will be broken and they will revert into humans. However, Cogsworth soon informs Mrs. Potts and the others that the Beast release Belle as his prisoner so she could go and care for her sick father. Later, when Gaston (the film's antagonist) storms the castle with angry villagers in pursuit for the Beast, Mrs. Potts and the other servants defend castle. After the Beast and Belle confess their love each other, the curse was broken, transforming Mrs. Potts and the other castle's residents into humans, and a ball was held to celebrate. This page was last edited on 19 March 2019, at 20:30.